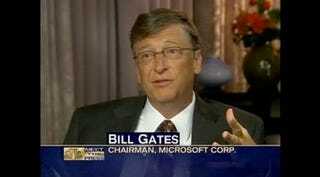 One-time Gizmodo guest-blogger Bill Gates was on NBC's Meet The Press on Sunday to discuss the good works of his and his wife's foundation. His one comment about the future of computers sounded Natal-y. So after 20 or so minutes of very positive talk about the work of the Gates Foundation to cure disease and help the needy, is Gates' response to Meet The Press host David Gregory about where computers might be heading. Remember, Microsoft's Project Natal is an Xbox 360-oriented device that uses advanced cameras, sensors and a microphone to detect users' gestures, facial expressions, voice and even the color of their clothing. David Gregory, host, Meet the Press: We can talk to each other? Gates: Absolutely. You'll be able to put onto the wall of your office a video conference with whoever you'd like and have the computer listen to what's going on there and create a transcript and make it searchable. And so, natural interface, I think is the thing that people underestimate right now. Yes, this is also a very Minority Report-ish future. And a Gamer: The Movie-esqe future. But that stuff is fake. Natal is real and could do some of what Gates is talking about.